This is my 8" Pietta 1858 NMA Pale Rider. I also have a Kirst gated conversion. Picking up a 5.5" 1858, and will probably use that for the gated one. I prefer the Pale Rider to the R&D, and the gated over the Pale Rider one. Faux-ivory grips from "Get A Grip". A little smaller than factory, and a better grip surface. Hoping it eliminates 1858 "knuckle knock!". 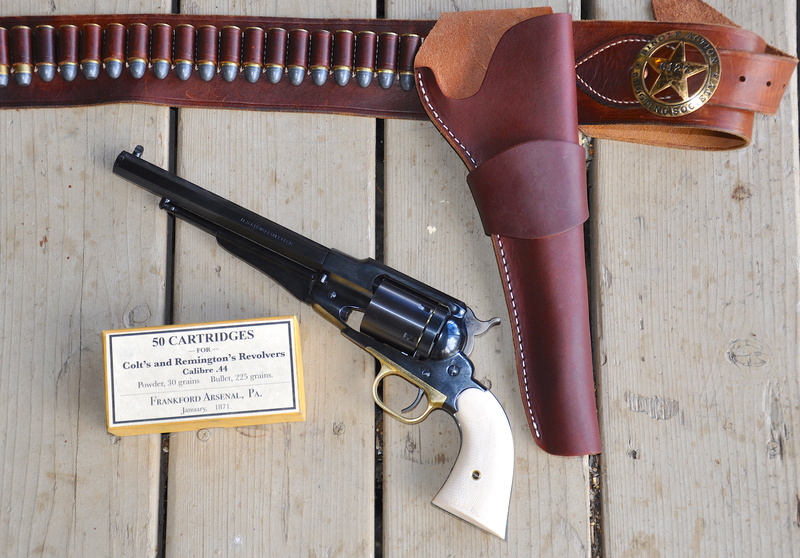 It is paired with my 1860 Colt Richards Type II conversion (also .45 Colt/Schofield) and my 1976 Vintage Navy Arms (pre-Uberti US made) 1860 Henry in .44-40. Looks good. That makes a fine pistol. I've always liked the original ported backing plates Kirst made before he put gates on them. One of those Pale Rider plates and a die grinder would get one fast. Hmmmm... that's a great idea! If you do it, be sure to post pictures. My persona is an ex-army, Civil War era, who migrates west and gets a job as a deputy in the Motherlode. Time period 1869 to 1879. Even after fancier rifles like the 1873, and 1873 SAA come about, he does not get rid of the weaponry that served him well in the "Great Unpleasantness". Same Henry rifle, and converted his 1958 and 1869 to cartridge conversions. "If it ain't broke, don't fix it!" It somewhat mirrors my own experience: I was in during the end of the Vietnam War, got out, and went to work for Nevada County Sheriff, in the California Motherlode. I later retired from Tuolumne County (in the southern part of the Motherlode) in 2000. Update; Used it at the local match today. The faux-ivory grips noticeably helped with the knuckle knock problem. Still there, but not painful. The Kirst Konverter functioned perfectly. Glad to hear those grips helped. Are they wider or thinner than factory grips? For me, the answer is thinner grips but your hand might need something else. You could temporarily put a layer of cereal box cardboard under each side to see if wider helps or hinders. Maybe you could get it even better.